2019 boating season is coming soon. 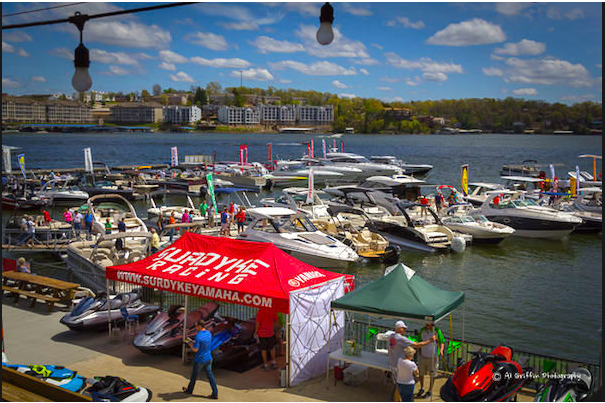 A great place to open boating season would be Lake Ozark Marine Dealers Association (LOMDA) Spring In-Water Boat Show April 12-14. Do not miss any boating opportunities this season, and there are some tasks you might want to do before spring launch. Tasks vary a lot depending on the boat you own, where you keep it, and what style of boating you might undertake. We created a short list of some important procedures that will get you ready for this season. Trailer maintenance would probably be the first step depending on where you keep your boat. Most of the boats in Missouri are trailerable boats. If you are one of the owners who use trailers often, you might want to start preparing for the season by checking if your trailer is all set to go. The condition of the tires plays an important role when it comes to safety while towing a boat, do not forget about the spare! Wheel bearings need to be checked as well greased or replaced if needed. Use a camera or help of a friend to check your brake lights and turn signals. Make sure trailer hitch and all related equipment are functioning properly. Do not forget about rollers and supports pads! Vessel preparation and maintenance is one of the first steps in making sure your boat is ready for the upcoming season. Required time may vary depending on the vessel you own. Make sure that engine or engines have all oils and lubricants added or replaced depending on the scheduled maintenance for your type of boat. A lot of people use services of a certified mechanics before the season to make sure engine(s) checked and tuned for the best performance and fuel economy. Also, the mechanic or marine parts manager can help you to figure out which spare parts you might want to carry with you at all times in case you have a breakdown. Navigation and safety equipment check is important as well. Your navigation should work, so do not forget to check them. Make sure replacement bulbs are available in case some of the lights go bad. VHF radio, radar, and GPS should work properly and may need some updates. A right number of life jackets approved by the coast guard is important in case of emergency. Most of the boat owners already know about required maintenance either if they just bought one or owned it for decades. But not every boat owner knows about the importance of boat insurance. According to U.S. Coast Guard Statistics in 2017 there were 4,291 registered accidents and approximately $46 million dollars’ worth of damage to property as a result of recreational boating accidents. The first misconception about boat insurance is closely related to homeowner’s insurance. Even though the boat can be covered under homeowner’s insurance but relying solely on it may lead to being under-insured. Generally, home insurance will offer minimal protection in some instances. It is important to consult with an agent in order to be sure that you and your loved ones protected during this boating season as well. Just like vehicle insurance, boat insurance has standard coverages that include liability, comprehensive, collision, uninsured/underinsured boater bodily injury. Liability pays for any damages or injuries you cause while boating, such as damage to other watercraft and objects, injuries to other boaters, passengers, your passengers including those skiing, boarding, or tubing. Comprehensive covers events that caused damage and were out of your control. Usually, those events include things such as theft and vandalism, explosions and fires, hurricanes, lightning, and other weather-related damages. Collision helps with damages that occurred to your boat if you collide with another watercraft or even submerged objects, regardless of fault. It also covers in case your boat capsizes. Uninsured/underinsured boater bodily injury helps to protect you from those boaters who are uninsured or underinsured. Medical payments pay for the expenses occurred due to the accident regardless of fault. Different carriers offer exclusive coverages for the boat owners. Therefore, an independent insurance agent has a privilege and flexibility to help you get covered for almost any occasion. Some of the carrier’s exclusive coverages may include things like no depreciation on repairs, wreckage removal and fuel spills, water sports coverage, or even roadside assistance which can help to cover is a trailer or a tow-vehicle become disabled. Some extra coverages offered by different carriers may include on-water towing or fishing equipment replacement.